Powers/Abilities: Decent fighter, skilled detective. Dylan Dog is a supernatural catalyst, so not only is he always in the middle of weird events, but often he unwillingly and without realizing it triggers supernatural events. Often Hell's "directors" take advantage of that and "use" him for their purpose. Dylan also possess what he call his "fifth sense and half", a sort of innate instinct which leads him to make the right choice in a given situation, help solve a case, or feel if he can trust a person or not. It is not 100% reliable and sometimes fails, especially if Dylan's emotions are involved. 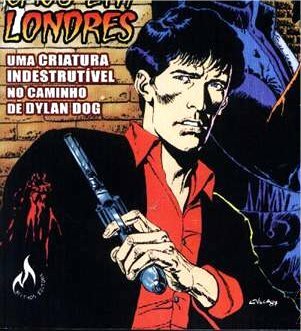 History: Former Scotland Yard police officer Dylan Dog is a London based detective who boasts "Nightmares are my job." He regularly takes on supernatural cases, battling vampires, werewolves and ghosts. He takes down serial killers and he's even faced off Death itself. In his private life he is a vegetarian with a love of pizza and horror movies. Comments: Created by Tiziano Sclavi. The first artist to work on him was Claudio Villa, who based his looks on actor Rupert Everett. 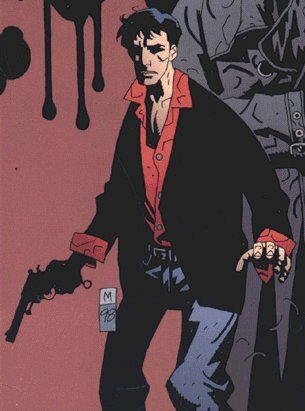 In 1999 Dylan Dog was reprinted in English by Dark Horse Comics. Thanks to Alessandro Masoni for first informing me of this character, and to "Fez" for more information on his abilities. Mike Murphy points out that "The 1994 Italian horror-comedy Dellamorte Dellamore (aka the Cemetary Man) is widely considered to be a thinly veiled Dylan Dog film (esp. considering the resemblance of Rupert Everett to the character)." This theory is supported strongly by Tiziano Sclavi having written the screenplay for the movie, and there actually being a Dylan Dog story of the same name, complete with a character of the same name and profession as the Rupert Everett character in said story. Tiziano seems to have melded Dylan with this other character when it came to the film. 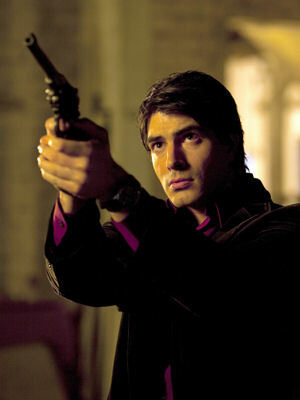 In the American movie adaptation, Dylan Dog: Dead of Night, Brandon Routh played the detective. Alex Diele adds "Dylan is vegetarian, he doesn't drink alcohol (he was an alcoholic after Lili's death), he suffers from vertigo and is afraid of bats. He suffers from Claustrophobia, too. The Dellamorte Dellamore movie is the adaptation of a novel by Tiziano Sclavi."